Ask anyone to name the world’s best basketball player, and you’ll most likely get the same answer: LeBron James. LBJ may be 32 and entering his 15th NBA season, but he’s still the consensus king of the league. If you want to have more fun, ask anyone to name the top five basketball players in the world. 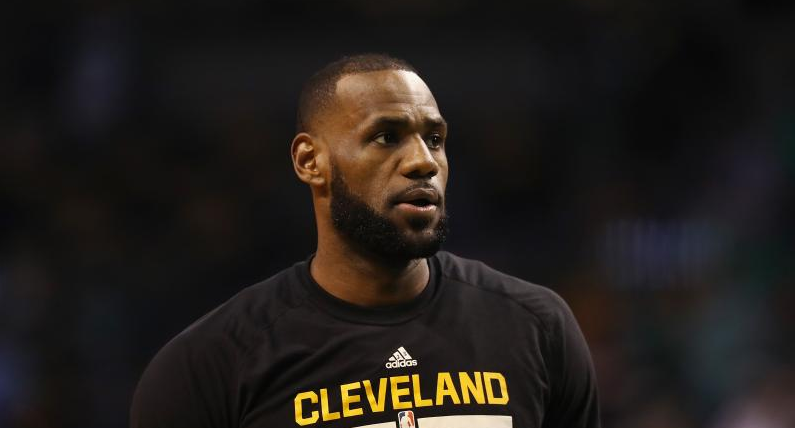 You’re sure to hear LeBron’s name, and you’ll likely hear a combination of these players to fill out the rest: Kevin Durant, Kawhi Leonard, Russell Westbrook, Steph Curry, and James Harden. You may even get an outlier, like Anthony Davis or Chris Paul, but most rational NBA fans can agree that these guys make up the top tier of NBA superstars. When you were thinking about who made up your personal top five, did you notice any trend with the players you were envisioning? LeBron plays in the Eastern Conference while the rest of the players reside in the West. So how far down the list do you have to go before you find the next best Eastern Conference player? The answer depends on who you consider to be the second best player in the east, and that’s what we’re about to explore. The smallest man on the court often puts up the biggest stat lines. Thomas was the third leading scorer in the league last year (28.9), and the catalyst behind the Celtics’ eighth-rated offense a year ago. IT4 has transformed his game over the years from a pure scorer as a rookie to an all-around offensive weapon at this point of his career. He still looks for his shot first and foremost, but he’s learned how to bait defenses into fully committing to him before kicking it out to an open shooter on the wing. Thomas was named to the NBA’s All-Second team this past season, but that’s an anomaly; it’s the only time he’s been named to the All-NBA team in his six-year career. Now that he’s in Cleveland, Thomas will be playing with an ever bigger chip on his shoulder than he already plays with, but his inability to defend anyone in the league keeps him out of the running for the honor of being the best player in the East not named LeBron James. The Raptors’ lead guard isn’t flashy, and his backcourt partner gets more (inter)national attention, but Kyle Lowry is the heart and soul of the Raptors. Over the last four years, Lowry has averaged right around 20 points and seven assists per game while shooting about 43% from the floor and a super-efficient 39% from beyond the arc. His contributions go far beyond the offensive end of the court. He’s also one of the better on-ball defensive guards in the East, making up for his short, pudgy stature with great timing and instincts. Lowry hasn’t been able to replicate his regular season success in the postseason, but he’s led Toronto to the playoffs in each of his four seasons in town when the team hadn’t reached the playoffs for five seasons before his arrival. While most All-Stars went West this offseason, Gordon Hayward came East. The former Utah Jazz star is reuniting with his college coach in Boston with hopes of finishing their combined quest to win a championship. Hayward can do a little bit of everything on court. As a rookie, he looked like Bambi learning to walk while trying to navigate through defenses as the ball-handler in pick-and-roll situations. Now, he slices and dices through defenses with the grace of a swan, punishing defenders under the rim who challenge his shot. He’s also a crafty creator capable of playing the role of facilitator if the situation calls for it. Hayward won’t be the top offensive option in Boston like he was in Utah, but his efficiency should see a nice little boost playing alongside a plethora of scorers who can space the floor and create more driving lines for him to exploit. 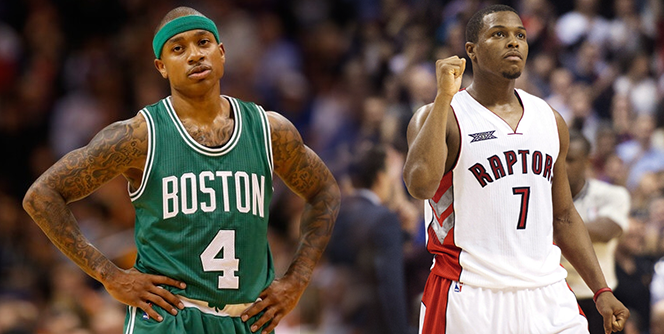 Boston’s newest weapon has Celtics fans dreaming of another Larry O’Brien trophy. Kyrie Irving is as good of a scorer as there is in the NBA. When push comes to shove and you need a bucket, there may be two or three players in the league you’d want taking that shot over Irving, and that list may be too long. The newest Celtic star is a magician with the ball in his hands and is one of the best finishers in NBA history, despite what the advanced statistics say. And because he’s an elite 3-point shooter, opposing teams need to monitor his every move, which should help create space and driving lanes for Hayward, Jaylen Brown and Jayson Tatum. Outside of his scoring ability, Irving doesn’t offer much else. His talent hasn’t translated to a ridiculous in-game impact on a regular basis. 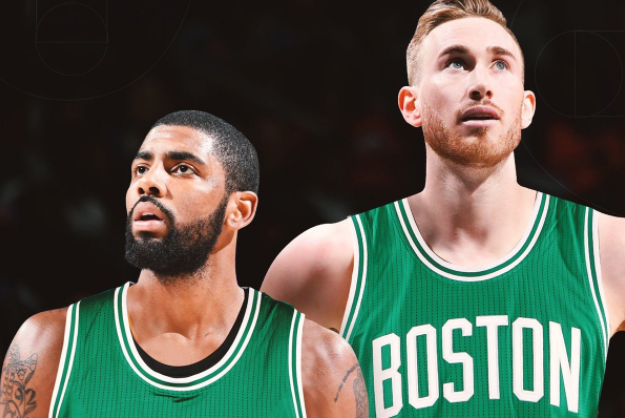 Irving wanted to be “the man” and now he’ll have a chance to do that, but the jury is still out on whether or not an Irving-led team can win a championship. 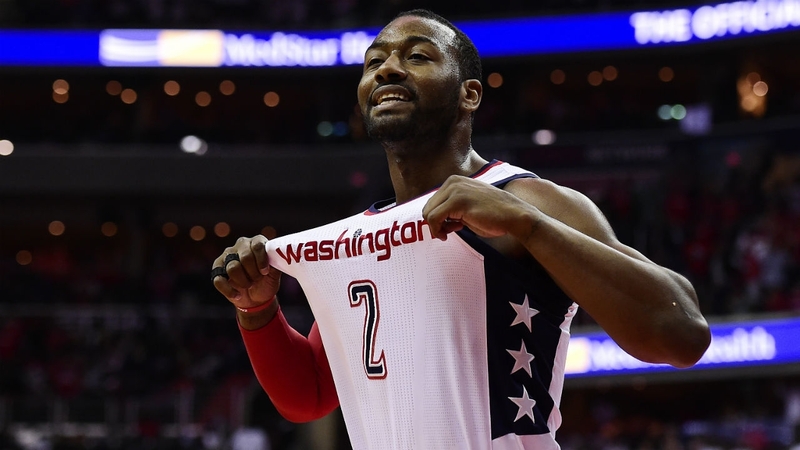 John Wall is a bonafide star who came up clutch when his team needed him most last year. Wall put up monster stats during the regular season (23 ppg on 45% shooting, 10.7 apg, 2 spg) and increased his production in the postseason (27.2 ppg) without sacrificing his playmaking (10.3). It’s virtually impossible to keep Wall out of the paint. He’s an elite ball-handler with even better quickness. That combination is lethal, and it’s even harder to guard Wall as he continues to develop his outside shot. Right now, that’s the only real hole in his game, and Wall still has plenty of time to improve. It’s hard to believe, but the Kentucky product is just 26 years old (turns 27 in September) and is on the front end of his prime years. The four-time All-Star is one of only a handful of players in the league you can feel confident about building a team around. The Greek Freak defies the laws of physics. No near-7-footer should be that fast, that athletic, that strong, that skilled, or that coordinated. And they definitely shouldn’t have all those traits, which is exactly what Giannis Antetokounmpo has. It’s like a NBA 2K MyPlayer came to life, and his stat line also looks like it’s from a video game. Last season, Anteteokounmpo became the first player to lead his team in all five major statistical categories (points, rebounds, assists, steals and blocks), earning him a spot on the NBA’s All-Second team. He was also named the league’s Most Improved Player for upping his averages in all five of those categories, and his scoring efficiency. The knock on the Greek Freak is that he can’t shoot, and there’s no way to sugarcoat that fact. GA is a career 28% 3-point shooter, below the league average.  Defenders can sag off him and force him to shoot, which cuts off some of his lanes to the rim. For most players, that’d be a deterrent, but as we’ve already established, Giannis isn’t a normal player. Even with his defender standing in the paint, he’ll put his head down and pound his way in, where he’s an unbelievable finisher with either hand. 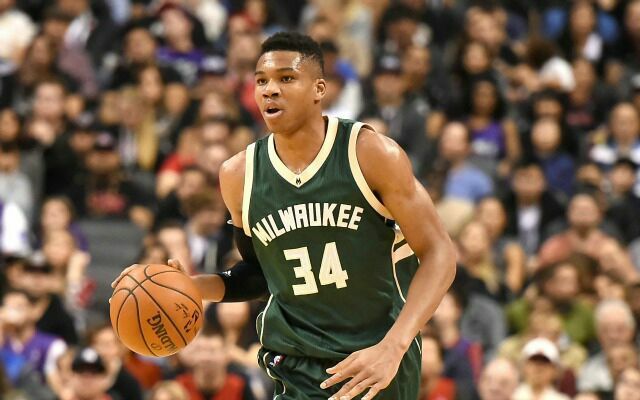 He may only be 22 years old, but Giannis already has one of the most well-rounded games in the NBA. Until he can consistently knock down the outside shot, he won’t be in the same category as scorers like Kyrie or Thomas, but he is more effective and productive in literally every other facet of basketball. His lone shortcoming isn’t enough to knock him out of the top spot. And don’t forget, he’s only 22. His potential is just like his wingspan—ridiculous.